Over the last two decades, the high sensitivity and spatial resolution of the VLA has revolutionized stellar radio astronomy. Using the VLA, major advances were made in studies of non-thermal radiation from a wide variety of stellar types. ALMA has extended imaging of stars to higher frequencies. Photospheric emission becomes much easier to observe at millimeter wavelengths owing to the Rayleigh-Jeans Law. ALMA can resolve the photospheres and chromospheres of giant and supergiant stars within a few hundred parsecs. Moreover, in addition to free-free emission, ALMA will allow (sub)millimeter imaging of thermal emission from dust in stellar envelopes. ALMA will detect the photospheres of stars across the HR diagram. ALMA images of the the star α Centauri (see Figure 5.1) indicate that the millimeter and submillimeter emission (measured at 0.44, 0.74, 0.87, 1.3, 2.1, and 3.1 mm) may be fit well by Solar chromospheric models, suitably modified. In the upper atmosphere of the Sun, nonradiative heating processes operate, which appear to be important in other stars. Kervella et al. (2016) used the ALMA data to improve the relative astronomy of components in the α Centauri system. ALMA’s ability to detect the photospheres of so many stars allows it to measure positions relatively often to astrometric accuracy. The orbit of any planet around its central star causes that star to undergo a reflexive circular motion around the star-planet barycenter. By taking advantage of the incredibly high resolution of ALMA in its widest configuration, we may be able to detect this motion. This will enable ALMA to indirectly detect planets which may orbit these stars. Figure 5.1: ALMA image at 740 µm of the α Centauri system. Components A and B are marked. The ALMA image also revealed a transient source (‘U’) whose nature is unknown. Figure from Liseau et al. (2016). As nuclear fuel deep within a star is burned, instabilities occur. These instabilities may result in a rapid increase in heating, which may be seen by observers as mass loss driver by a thermal pulse. Nuclear-processing enriches the outer envelopes of the star, and as dense warm material enriched in C, N, O, P, S and Si deep in the star cools, condensation produces stardust. The dust is accelerated outward during pulses and drags gas along with it into the circumstellar envelope, which may be imaged in dust continuum or in the lines of molecules such as CO, SiO and their isotopic variants. Thus, ALMA provides a sensitive probe of not only the physics of the stellar matter but of its nucleosynthetic origins. In several studies, ALMA's high resolution has identified unknown components of stellar systems while its spectral line sensitivity has provided insight into isotopic variations within lost-mass shells and into dust formation processes near the stellar photosphere. ALMA's sensitivity has even allowed measurements of molecular emission from AGB stars in the Large Magellanic Cloud (Groenewegen et al. 2016). In several instances, ALMA has imaged spiral mass loss patterns suggestive of interaction between stars buried deeply within various systems. In one remarkable recent study, the bifurcation of the spiral-shell pattern that is clearly visible in the ALMA images of LL Pegasi (see Figure 5.2) led investigators to conclude the binaries are in a highly elliptical orbit, as this pattern is a unique characteristic of elliptical binaries. ALMA has also imaged the molecular shell and circumstellar medium of the AGB star R Sculptoris with unprecedented detail (Maercker 2012, 2016; see Figure 5.3). The ALMA data shows that the shell originates with change in mass loss rate and expansion velocity during a stellar thermal pulse which occurred about 2300 years ago. The shell is entirely filled with molecular gas and dust. The high resolution ALMA observations provide singular evidence for the thermal pulse phenomenon in these stars, important for understanding the duration of the star's life on the Asymptotic Giant Branch, its mass loss and the process by which heavy elements are returned to the interstellar medium. 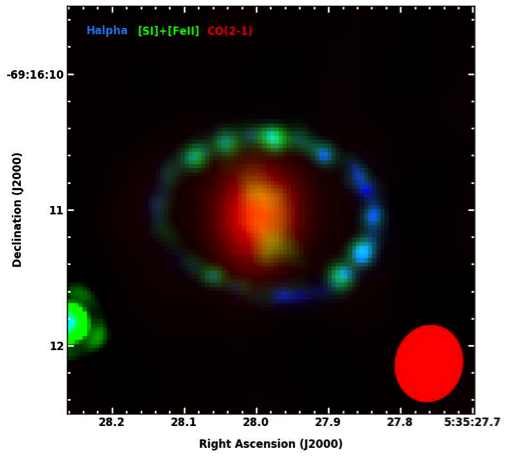 Figure 5.2: ALMA image of the CO emission from the molecular shell around the AGB star LL Pegasi and its stellar companion. From the structure of the shell, Kim et al. (2017) were able to determine that the two stars circle each other in a highly elliptical orbit. Notice the deviations from the spiral pattern compared to R Scl in Figure 5.3, for which the orbit is apparently less elliptical. Credit: ALMA (ESO/NAOJ/NRAO) / Hyosun Kim et al. Figure 5.3: ALMA CO J=3-2 image of the molecular shell around the AGB star R Scl. 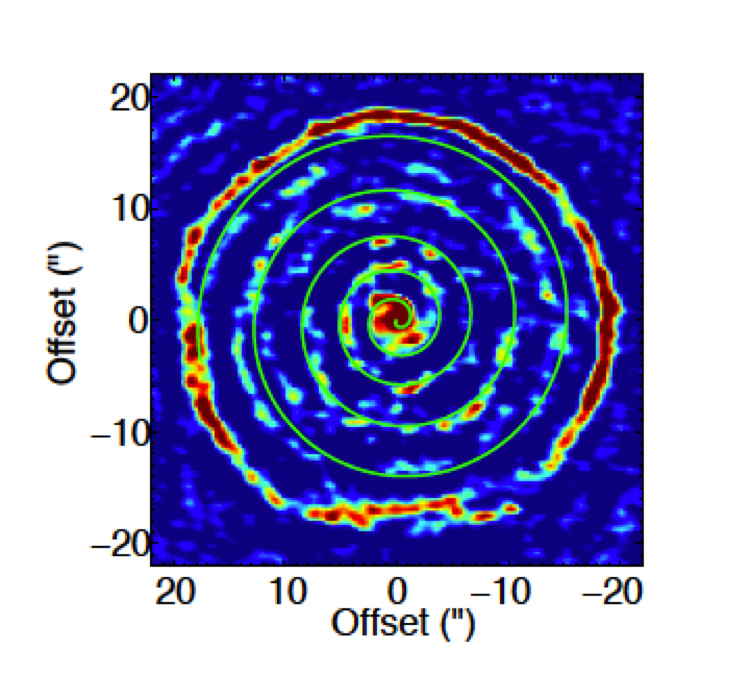 The blue spiral connects emission components and shows the pattern of mass loss from the central star guided into the spiral by an unseen companion. Figure from Maercker et al. (2012). ALMA's excellent imaging has unveiled similar structures in other AGB stars. Decin et al. 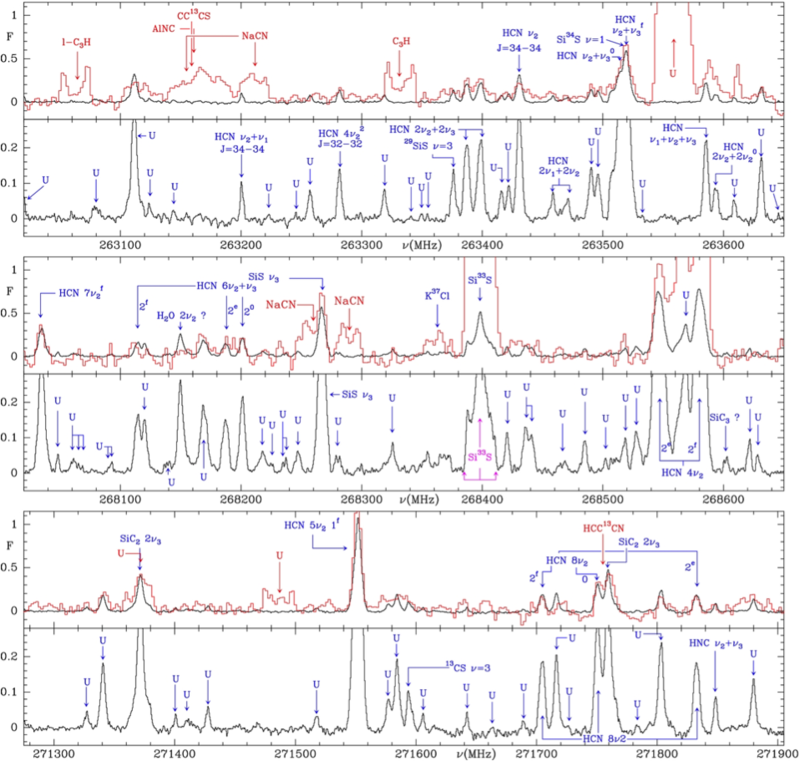 (2015) showed that correlated structures seen in molecular images of the evolved carbon star CW Leo (IRC+10216) may result from spiral shell structure induced by an unseen binary companion, in a similar fashion to that seen in R Scl. Quintana-Lacaci et al. (2016) found evidence for this inner slowly rotating or expanding spiral or toroidal structure in their observations of NaCl and KCl near the star. ALMA's sensitivity enabled serendipitous detection of the vibrationally excited pure-rotational CO transition v=1, J=3-2 previously only seen in CW Leo towards five asymptotic giant branch (AGB) stars, o Cet, R Aqr, R Scl, W Aql, and π1Gru (Khouri et al. 2016). They showed that the observed lines form in the warm molecular layer above the stellar surface but just below the region of the molecular wind, offering a probe of this poorly understood region. Kervella et al. (2016) imaged the nearby AGB star L2 Puppis. They were able to determine a mass for the primary star and to locate a secondary only 2 AU from it, of about ten Jupiter masses, which could be a planetary or low mass brown dwarf companion doomed by the evolution of the primary. Figure 5.4: CW Leo spectra in selected parts of a 20 GHz bandwidth. Upper panels (red) show IRAM 30m spectra, lower panels show the ALMA data. Figure from Cernicharo et al. (2013). Cernicharo et al (2013 ApJ 778 L25) imaged IRC+10216 with ALMA in nine excited vibrational states of HNC J=3-2 covering energies up to 5300 K. The radius of the unresolved emitting region is 0.6" or three stellar radii, similar to the event of dusty clumps observed in the infrared. The physical and chemical conditions in the dust formation zone should be characterized by modeling of inner envelope species. Owing to the high sensitivity, a briar patch of narrow and unidentified lines was seen. After the outer shell of the star is lost, the hot central stellar remnant is exposed, and its energetic radiation begins to ionize the remnant circumstellar shell, creating a planetary nebula. 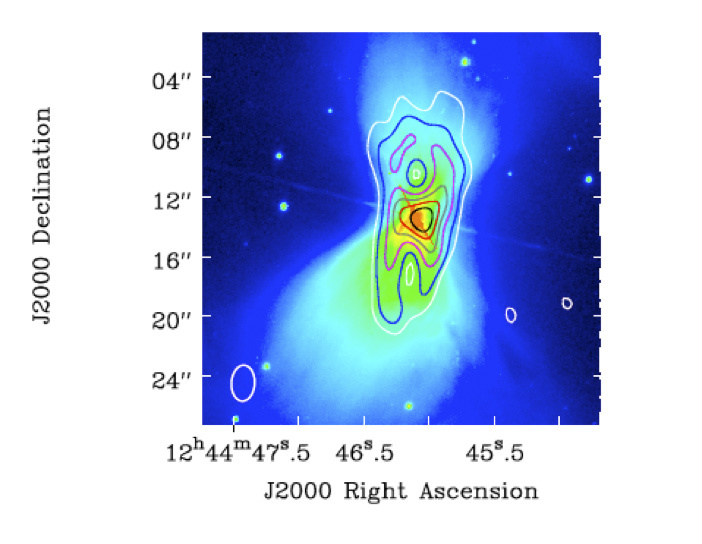 ALMA observations of the Post-AGB objects the Red Rectangle (Bujarrabal et al. 2016) and IW Carinae (Bujarrabal et al. 2017) suggest the presence of long-lived rotating equatorial disks and expanding gas shells, which might survive as the objects possibly evolve to planetary nebulae. Many planetary nebulae are markedly asymmetric, with material flowing outward at high velocity in the polar direction, and at lower velocities equatorially. Often a region of neutral gas and dust is found in the equatorial plane; ALMA provides excellent high spatial and kinematic sensitivity for imaging these regions. The Boomerang Nebula is one example of such an object (see Figure 5.5). Figure 5.5: The Boomerang Nebula reveals its true shape with ALMA (Sahai et al. 2013). The background blue structure, as seen in visible light (HST), shows a classic double-lobe shape with a very narrow central region. ALMA’s ability to see the cold molecular CO gas reveals the nebula’s more elongated shape, in contours. The ALMA data suggest a model incorporating two nested spherically symmetric shells: a warm inner shell extending 2.5–6'' with an expansion velocity of about 35 km/s and a cool, extended outer shell extending 6''–33'', with a velocity of about 164 km/s. The latter shell is cooled below the temperature of the cosmic microwave background through adiabatic expansion. The ALMA observations show that the inner component is bipolar, with a dense waist, and the outer component is patchy but roughly circular and similar in dimensions to the model, bearing in mind that a significant fraction of the flux in absorption has been resolved out. Credit: Bill Saxton; NRAO/AUI/NSF; NASA/Hubble; Raghvendra Sahai. The Water Fountain Nebula (IRAS 16342-3814) is the best-studied member of a small class of very young pre-planetary nebulae with 22 GHz water maser emission spread over a few hundred km/s in velocity. It originates in a pre-AGB central oxygen-rich star of spectral type K located at a distance of 2 kpc from the Sun. Several stages of evolution of the Nebula are detailed in Sahai et al. (2017) based on ALMA observations. Four evolutionary stages may be seen at once in their interpretation: a compact circumstellar envelope with large dust grains lying in a torus, powering a high velocity outflow, within an extremely high velocity outflow, all within the circumstellar envelope of the evolving star. A similar, somewhat more evolved planetary nebula is NGC 6302, observed by Santander-Garcia et al. (2017). In both cases ALMA's excellent sensitivity and imaging performance have helped to reveal the evolutionary details of the regions. VY CMa is an oxygen-rich red supergiant well-known for the complexity and large mass (25 Msolar) of its envelope. Using ALMA Science Verification data, Richards et al. (2014) and O’Gorman et al. (2015) imaged VY CMa in the submm dust continuum and in the emission lines of water masers at 658, 321, and 325 GHz. The ALMA images at the highest frequency trace dust on spatial scales down to 11 Rstar (71 AU), locating two prominent components. One of these is associated with the star but the brighter component ‘C’, lying about 400 AU to the southeast, is massive, cool (Td ≲ 100 K) and lacks molecular emission near its peak. Overall the dust emission displays an anisotropic morphology, with 17% of the total dust mass located in clumps within a roughly spherical stellar wind. This pattern suggests continuous directional mass loss over decades. The masers extend over ~90 km s-1 and lie in irregular thick shells about the center of expansion, confirmed as the stellar position. Different transitions, however, form non-overlapping clumps with velocities consistent with expansion but exhibiting drastic and irregular departures from spherical symmetry. The maser inner rims lie at successively larger distances from the star, while the outer rims lie within the central 1.2” at ~2500, 6300, and 7500 AU in the order of the transitions given above. Bright elongated maser features suggestive of shocks are seen at up to 2000AU from the star, perhaps associated with dust formation. Figure 5.6: Continuum emission from VY Canis Majoris imaged by ALMA. The color scale is 321 GHz continuum and the contours are the 658 GHz continuum. The two dust continuum peaks are marked as “C” and “VY”, where “VY” is centered on the stellar position. The asymmetric dust distribution on inconsistent with models of convective driven only mass loss, and suggest other forces are needed to explain the observations. Figure from O’Gorman et al. (2016). The object η Carinae is considered to be an important short-lived unstable phase in the life of the most massive stars in galaxies, shortly before they explode as supernovae. It is one of the most luminous galactic sources and is regarded as an extreme case of a Luminous Blue Variable. This source may consist of two very massive (50-80 Msolar) stars in a wide 5.5 year orbit. The binary is surrounded by a highly bipolar nebula containing 1-2 Msolar of material, which was ejected by one of the stars in 1843. No other stellar object (apart from supernovae) is known to have such extreme mass loss (i.e., ≈ 2x10−3 Msolaryr−1). At submillimeter and millimeter wavelengths, η Carinae is also a very bright source showing regular variations with a cycle of 5.5 year; it reaches about 40 Jy at maximum at 230 GHz. The variation in flux density is due to eclipsing events from the binary system. In addition, η Carinae is a strong emitter in the hydrogen lines. After the outer shell of the star is lost, the hot central stellar remnant is exposed, and its energetic radiation begins to ionize the remnant circumstellar shell, creating a planetary nebula. Many planetaries are markedly asymmetric, with material flowing outward at high velocity in the polar direction, and at lower velocities equatorially. Often a region of neutral gas and dust is found in the equatorial plane; ALMA provides excellent high spatial and kinematic sensitivity for imaging these regions. The Boomerang Nebula is one example of such an object. An ALMA image of the Boomerang obtained by Sahai, Vlemmings, Huggins, et al. (ApJ 777, 92) shows a central hourglass-shaped pre-planetary nebula surrounded by a patchy, but roughly round, cold high-velocity outflow centered on a dense waist containing large grains (yellow in the image above). As the flow from the central star expands, it cools through adiabatic expansion. This process has cooled the envelope substantially below the temperature of the Cosmic Microwave Background, the 2.7K relic radiation from the Big Bang which pervades the Universe. Thus the region appears to be among the coldest in the Universe, ironic for material so close to a hot central star. The ALMA observations also show that the outer regions of the CO flow are rewarmed, probably by photoelectric grain heating. An oxygen-rich red supergiant well-known for the complexity and large mass of its envelope is VY CMa. Using publicly available ALMA Science Verification data, Richards et al. (2014) and O’Gorman et al. (2015) imaged VY CMa with in the submm dust continuum and in the emission lines of water masers at 658, 321, and 325 GHz. The ALMA images at the highest frequency trace dust on spatial scales down to 11 R⋆ (71AU), locating two prominent components. One of these is associated with the star but the brighter, component ‘C’, lying about 400 AU to the southeast is massive, cool (Td ≲ 100 K) and lacks molecular emission near its peak. Overall the dust emission displays an anisotropic morphology, with 17% of the total dust mass located in clumps within a roughly spherical stellar wind. This pattern suggests continuous directional mass loss over decades. The masers extend over ~90 km s-1 and lie in irregular thick shells about the center of expansion, confirmed as the stellar position. Different transitions, however, form non-overlapping clumps with velocities consistent with expansion but exhibiting drastic and irregular departures from spherical symmetry. The maser inner rims lie at successively larger distances from the star, while the outer rims lie within the central 1.2” at ~2500, 6300, and 7500 AU in the order of the transitions given above. Bright elongated maser features suggestive of shocks are seen at up to 2000AU from the star, perhaps associated with dust formation. Millimeter observations of supernovae (SN) complement observations at other wavelengths in important ways. As the radio spectrum of a supernova evolves, the higher peak flux density is expected to occur earlier in the millimeter wavelength regime. Thus at millimeter wavelengths, one might observe supernovae more promptly and further away than at longer wavelengths. Very bright SNII could easily be detected and monitored with ALMA up to a distance of 350 Mpc; i.e., z ~ 0.1. Figure 5.7: ALMA identified CO and SiO in the SN1987A inner ejecta. The CO clumps contain at least 0.1 Msolar of CO, an order of magnitude more than measured in the first few years after the explosion. Figure from Kamenetzky et al. (2013). As the ejecta expand and cool, dust is formed. Recent ALMA observations of Supernova 1987A in the Large Magellanic Cloud showed that dust continues to form (see Figure 5.6). Furthermore, CO and SiO molecules are also found in the central regions. In fact, although the data were too fragmentary for an analysis, both abundant Si isotopes (28Si and 29Si) were imaged over partial velocity extents. This suggests that ALMA might probe the nucleosynthetic character of the debris around the remnant, illuminating the evolution of its central star. ALMA views the full velocity range of emission, unobscured by dust. Doppler tomography will be possible in CO and other molecules to probe the spatial, chemical and kinetic environment within the inner ejecta. Gamma ray bursts (GRBs) are the brightest transient phenomena in the Universe, arising from poorly understood physical catastrophes which may involve the collapse of the densest core of a massive star to a Black Hole, or possibly the coalescence of two collapsed objects. Millimeter emission lags the high energy burst in time and can provide key insight into the development of the burst. The development of the burst can then be used to derive the energy, density and other key parameters of the explosion and help characterize the nature of the originating event. Even pre-Early Science ALMA was capable of measuring a GRB—test observations were made of GRB110715A at z=0.8224 and made public as part of Science Verification (Sanchez-Ramirez et al. 2013).